When Courtney and I were brainstorming ideas for summer recipes, I also happen to receive a ton of requests from friends for salad recipes. 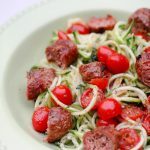 Salads that were more than just greens and tomatoes but not necessarily pasta or potato salads. Salads that are healthy! But also, salads with some bite to them! 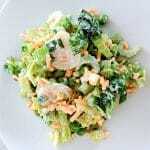 Salads that will hold up at the pool or beach. Salads that are health conscious but filling enough to keep you from reaching for the kids’ goldfish bag. Or at least, keep you from reaching for it too often. 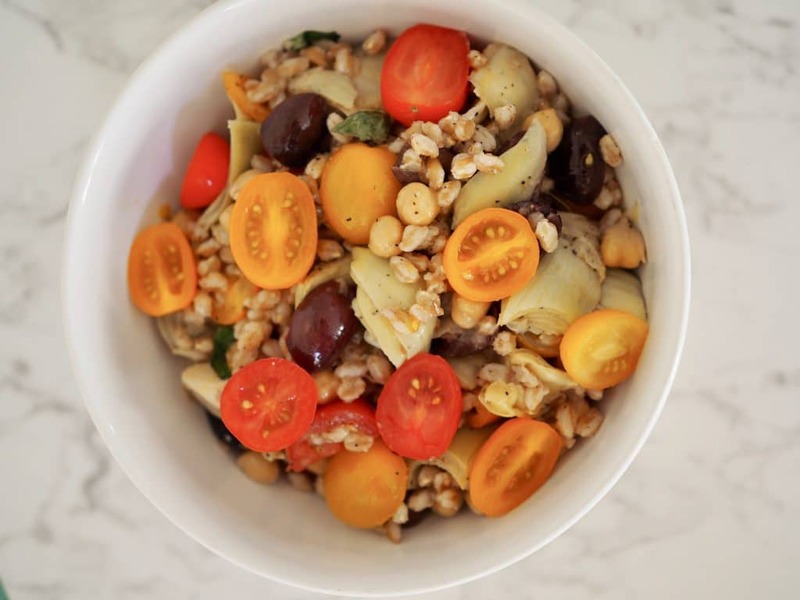 Here is a Tomato and Olive Farro salad to kick off what I’m anticipating will be a summer series of salads– salads that satisfy your appetite but also acknowledge the reality that you may be in a swimsuit for the next 3 months! I hope you enjoy it. 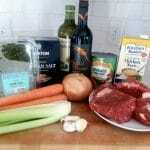 Come back for more salad recipes soon! One of the biggest perks of living in our town is the beautiful community pool. When we lived in Brooklyn, summers were really challenging: It would be 95 degrees, and I’d drag both twins and all their gear and snacks in a stroller to the local public park sprinklers, often only to find whoever was in charge of turning them on, had not turned them on that day. It literally brought all three of us to tears on occasion. Now that we’re in our great little town, I never take our summer time pool days for granted. We’re usually at the pool by lunch time and we stay through dinner time, packing pajamas to change into before we head home. And, my kids are finally all at an age where, if I come prepared, I can sit back, kind of relax (kind of! 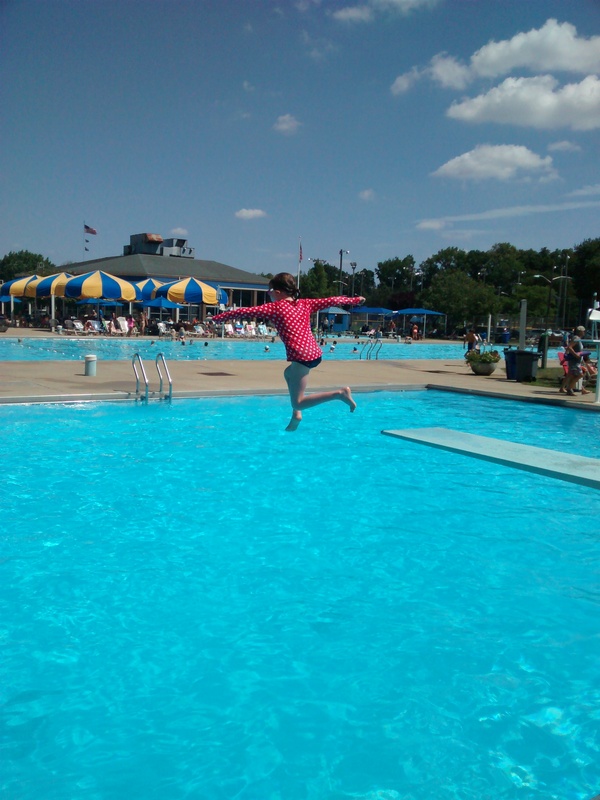 ), enjoy my lunch, while I watch them all swim (or even better, jump off the diving board for the first time!). It’s heaven! There is always the temptation of relying on the pool snack bar to supply snacks and dinner, but it’s not the healthiest food, and the purchases add up to more money than I want to spend every day at the pool. So, the kids are allowed to grab an ice cream there once a week, but the rest of the time, I pack them healthy snacks and meals. I also pack myself a really great salad for lunch. I typically make a large batch of one on a Sunday, which gets my through a few days at the pool. Then, I make another one for the rest of the week. It guarantees that I eat healthy, filling meals. And, it just takes a little planning and prepping. 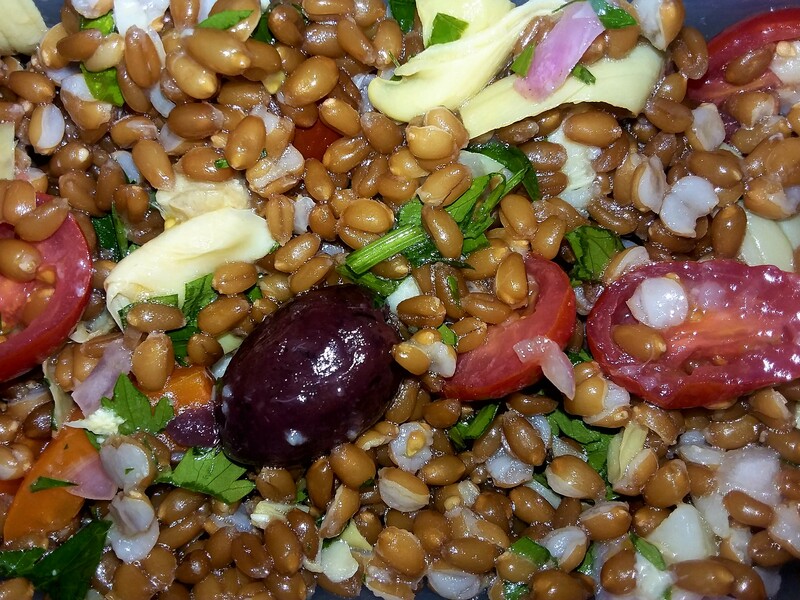 Recently, I shared this farro salad with a friend, who promptly asked me for the recipe. 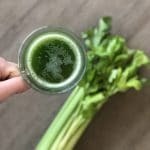 It’s easy, and you can make it your own by adding a protein (tuna or garbanzo beans would work well) of your choice or switching up the herbs. 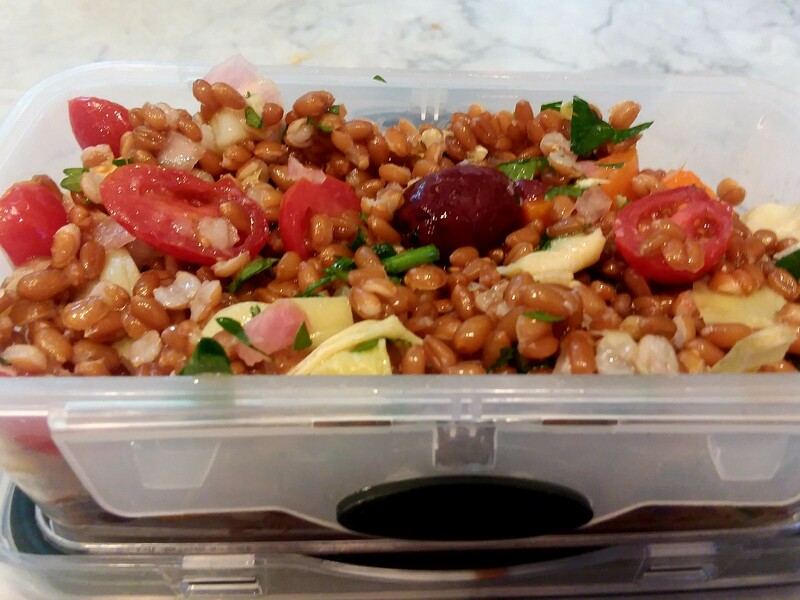 I like farro in this because it holds up well even when it’s dressed, but if you’re gluten free, feel free to substitute brown rice or quinoa. Cook the farro according to the cooking directions. *Different types of farro require different cooking times. 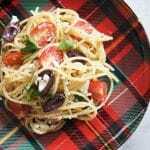 Combine the tomatoes, shallot, artichoke hearts, olives, basil, and parsley together in a large bowl. Once farro is cooked and cooled, add the farro. In a small bowl, combine the olive oil, vinegar, mustard, pressed garlic, and salt and pepper, whisking well. Add any desired protein: chick peas and tuna work well.